Left click on the valve model to open its settings. Select the spool centre condition from the drop-down list box. The symbol will show which one is being used. 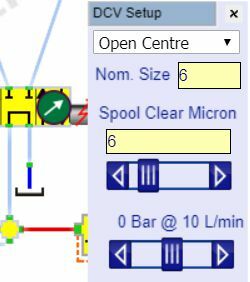 Enter the nominal bore size in the second edit box, use 6 for and CETOP 3 (NG6). This will affect the pressure drop through the valve at higher flows. Set the spool clearance in micron. This determines the amount of leakage through the valve across any land that is closed. All spool valves will have leakage although poppet valves will be virtually zero and have not been checked yet. Adjust the flow slide bar to see a typical pressure drops across the valve. Usually, valve datasheets have typical flow vs pressure drop curves for each spool so you can adjust the nominal size to give the most appropriate curve if the size is not specified. There are no valve dynamics included. 2 way 2 position valves are still in development. You can use a 4 way valve as fluid leaking onto the PC is not a safety issue in this simulation.